I really love this little sequence. 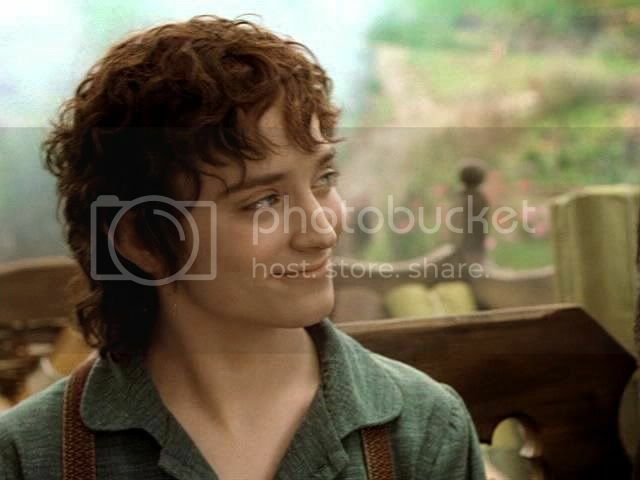 It is one of the few chances to see film Frodo as the sort of well-adjusted, good-natured, good-humoured young bachelor hobbit we meet at the beginning of LotR. This scene happens right after we see the hobbit children bouncing up and down in the lane (including the one wearing the extremely unfortunate wig -- the white-haired one that looks part little Bo Peep and part barrister), calling to Gandalf for fireworks. Frodo gives Gandalf a plaintive, “Awww…” look (very plaintive); Gandalf weakens. 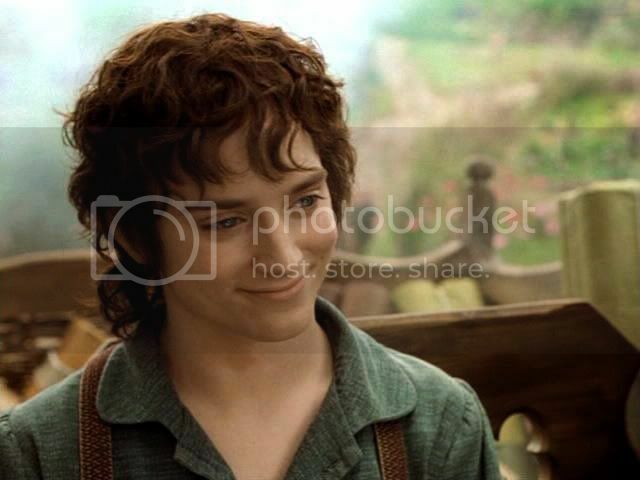 Frodo’s pleasure shows itself in a slow little smile, that seems part amused wistfulness and part satisfaction (having gained his point). I go down on my knees in thanksgiving to the screencapping gods for making such drooling possible. In the actual film such moments just flash by. Yes, that series is most exquiste. He looks so gracile and translucent, and yet not too "otherwordly". I'm very grateful you've discovered a new hobby, Mechtild ;-)! Oh please keep doing this! I screen-captured this myself but missed a couple of really good ones that you didn't. Sigh is definately the word. Every second of the beginning.. when he is just this happy,(BEAUTIFUL!) 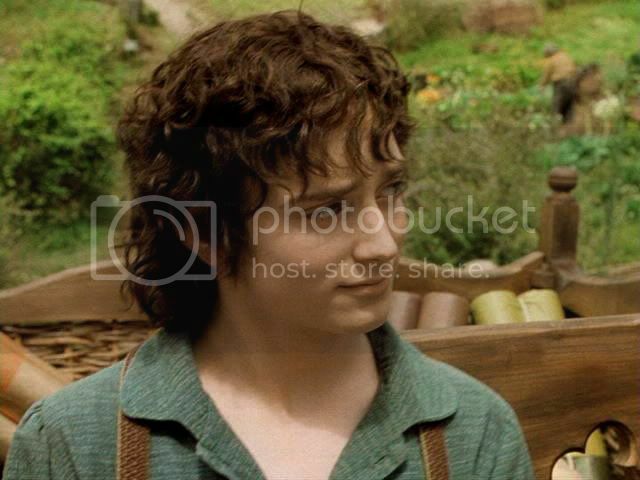 untroubled and enthusiastic young hobbit is so.. well.. PRECIOUS to me is the only way I can think of to put it.. as hateful as that word has become. I was SO hoping that the extended version would give me more. As much as I like to stare at lots more scenes of drooling orcs (this is sarcasm.) I would have rather had extra footage of happy, laughing and untroubled hobbitage.. but that's just me. Re: Oh please keep doing this! 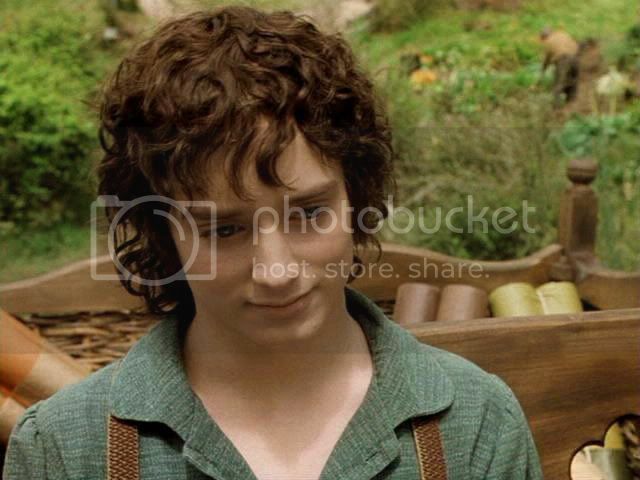 Yes, I would have liked more "happy Frodo", too. 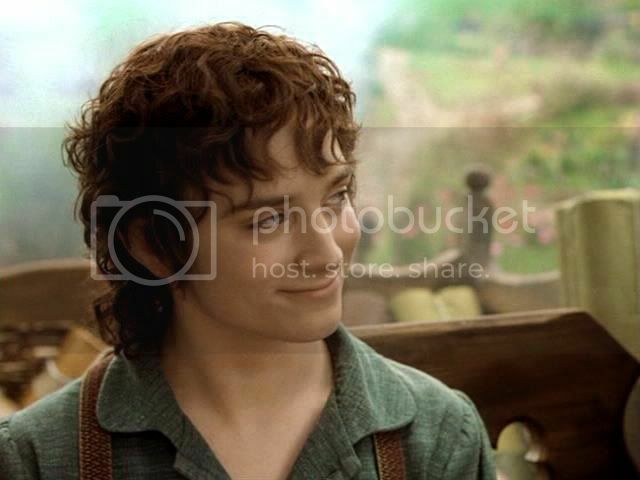 Actually the EE has less, not more, happy Frodo. I never saw the theatrical release in theaters, and only purchased the EE. But I can see there are moments in the theatrical that did not make it into the EE, once the extended "Concerning Hobbits" opening was added. I do think the EE is better, but I sure do miss seeing those Fro moments! With screencaps, I can have BOTH. Yippee! You have screencaptures, too? Perhaps you might link them, if they are in a format that can be made available. Frodo smiles...I smile! Thanks, Mechtild. I am so behind in KD and here in LJ. But, I need to friend some of those from KD here so I can find you all easier. And the screencaps, I would love to see all that you do. I'm beginning to think I need to watch them again. I'm humming the Star Wars theme too much these days. Can someone give me a little "Friending 101". I found Ariel or she found me and it worked. Okay, I'll stop rambling. Can someone give me a little "Friending 101". The easy way to friend some one, I found out after a lot of misunderstandings, is to go to their "User Info" page, first. Just so you can see what I mean, here's a link to Peachy's "User Info" page, just to refer to (or to friend her, of course). After you click it open, look at the top of the screen. See the light blue hortizantal bar in the middle, with five icons in a row (l to r: a head, a paper, a heart, a magnifying glass, a gift)? If you click on the head on the left, it will identify itself as the "add a friend" button. Click it and it will take you to another window, asking if you want to add that user to your friends list. You click, "yes," and that's that. Having said that, if someone clicks my "friend" button, I have to notice that their name has shown up on my list at the bottom of the User Info page, and then manually friend them back. I always then have to go to the upper menu bar on the LJ top, put my mouse cursor on "Manage", then click "Friends" when it appears. That takes me to a page where I can click an "edit friends" box. I click that box and it gives me a list of names on my friends list, with little boxes to click if I want to add or delete. I find the name of the person who has added me to their list and click their box, which that adds them as a friend when I click, "save changes". I am sure there is an easier method but I don't know what it is. Sorry! I think it worked right. Thank you! I saved your directions just in case. Mechtild, I went to my User Info page and also my edit friends page and You aren't there with a little box deal to check. So I guess it didn't take when you friended me or something. (I also tried dumping my internet cache to see if that helped but it didn't.) So I went to your page and friended you by clicking on the head. Hope I didn't mess anything up. I am sooooo enjoying your fanfic story! ooOOOOoooh, I just *LOVE* this screen cap, I always have! :) That's the face I used for Fro's tuxedo shot last year too, hee hee! :D Mech, this is great; you're our new Screencap Queen! AND, you know just the right shots to get! Oh, Moria is a LONG way off. I think I know the shots you mean, Frodo's hood is drawn up in a saintly manner. Ereshkigal called those his, "Virgin Mary" screencaps, LOL. I view this Frodo as the pure, "before" Frodo. He's lovely, but innocent, untroubled (except by minor worrying about Gandalf)-- and he may never have been more than this is the Ring hadn't come along. This is the gold before it was poured into the crucible. I love and mourn when I see these scenes. Why should you be the only one?